Bardulf was now ready. He took the restraints off of Gryth’s leg. He looked Gryth straight in the eye and visualized the Ring of Emeth, very clearing in his head. “Go find.” Bardulf bid as he launched Gryth up in the air. Through the Crystal Ball, Bardulf reassured Gryth that he was to finally go search for the ring. Earlier, Bardulf dispatched some troops to the White Throne mountain, hoping to garner more information. When his men discovered two of the best horses missing, he’d ordered a few men to follow the road to catch up with and punish the horse thieves. At this late hour, he enlisted the aid of more nearby troops to follow behind. Swartzborg was east and south of UR. It would take some time for Gryth to reach UR, and longer yet to reach Oxted. He did not know the creature’s endurance. He let Gryth stop to take rests if he couldn’t find an updraft to float upon. If Gryth followed the ring, it was in a general north westernly direction. Bardulf did not let him take the straightest course. He wanted his men to follow Gryth as his backup. So he steered Gryth to stay near the main roads, and close to areas and land marks familiar to Bardulf or on the maps he was consulting. Gryth followed the usual westward route. Bardulf aimed to intercept his handful of men who had been ordered to apprehend some thieves. Those men were the closest in proximity to his ultimate target. His men had traveled most of the way through the stretch of the great plains when Gryth caught up with them. A young Lieutenant Bondfeld was in charge of those men. It was a point of pride for Lt. Bondfeld to notice everything around him, at all times. On this day, his keen observations were rewarded. He recognized Bardulf’s pet and stayed his men from raising their weapons. The Lieutenant looked up and addressed the creature. “G-G-Grit, you are called?” he asked. As Bardulf directed Gryth to move toward the Lieutenant, a gurgling sound came from the throat of the beast. Gryth dropped a weighted parchment down to him. The Lieutenant nodded as he read further, “When the little dragon stops by certain people and does not move on, immediately apprehend those people, keep the one with the ring alive.” When the Lieutenant completed the message, he saluted the dragon, then made ready to carry out his new orders. Bardulf’s message also informed the Lieutenant that Gryth was his eyes. Bardulf could see everything through the eyes of the little dragon and now he looked directly upon the Lieutenant as he read that very message and could also see his men. The Lieutenant was bright, inquisitive, practical, and very rattled. Following a dragon-lizard was at least different. His men easily fell into the change of routine. They were encouraged through good humor. Lt. Bondfeld wore his most serious face and his mannerisms became more formal. Given his seriousness, his men became doubly amused to have witnessed the absurdity of their superior saluting a lizard. This entry was posted in Jasmine & Role Playing Games, The Creative Process and tagged Bardulf, Bondfeld, crystal ball, Gryth, Swartzborg, White Throne Mountain on May 8, 2018 by Darlene. 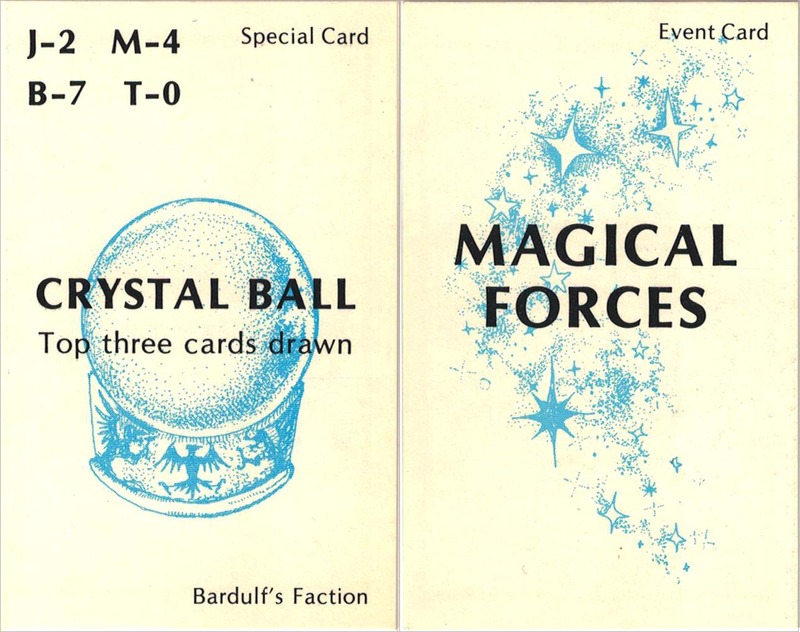 The Special Card, “Crystal Ball” and an Event card, “Magical Forces” from JASMINE: The Battle for the Mid-Realm Collector card game. All morning, Bardulf spent time with Gryth. The Tome of Wisdom gave him the idea that he could magically teach the dragon-lizard to always return to him, despite who wore the ring. He intended for the creature to locate the ring once and for all. To achieve this goal, he would need to make a lot of preparations. The first thing he did was locate a small crystal to function with his crystal ball. Through magical incantations, he programmed them to function as both sender and receiver. After he established resonance and frequency between the stones, he endeavored to find a way to place the crystal upon Gryth. He tested different ways the crystal could be attached and settled on the sturdier method of having it strapped with leather onto it’s chest in front. The other choices either hindered Gryth’s movement, or fell off. While Gryth flew, Bardulf tested the communication between the crystals until he discovered the exact words of power spoken with the exact tone to achieve the most desireable effect. When at last satisfied, he moved onto the next stage by stepping onto his balcony with Gryth on his arm. He placed the dragon-lizard on the bannister and it flapped its leathery wings in excitement. Gryth’s leg was already tethered to a sturdy string so he could only fly as far as its length. Bardulf went back inside to consult the crystal ball. Together, the crystals became his eye. And a wonderful eye it was! Bardulf was elated to be able to “see” everywhere Gryth went. Gryth might prove to be the best spy ever! But it all depended. Next was the hard part. Through the amplification of the crystal ball while using the smaller one to focus, Bardulf increased his power of concentration to the point where he could command the dragon-lizard with his mind. He began small, with little requests, like turn right, pick up that stick, fly to upper branches of a tree or land at a specific place on the ground. Through trial and error, Bardulf tested and honed the effectiveness of how the Crystal ball and the quartz crystal worked together. He never wanted to chance losing Gryth, nor did he want to lose the ring, now that he knew more about it. The Tome of Wisdom called it the Ring of Emeth, though it wasn’t a ring at all. It was the crown of a faery-king, with the ability to travel in and out of dimensions. Gryth was a faery-dragon, his mount. The reason Gryth homed in on the ring was he instinctively knew that was the way home, the way to return to his own familiar surroundings in his own dimension. When he read the passage, Bardulf wondered what could possibly have happened to the faery-king. How did his uncle initially run across the ring or the creature? And did he know that a faery realm co-existed with the Mid-Realm? In the days it took Jasmine’s group to leave the temple at the Great White Throne Mountain and traverse the east-west road past the northern crossroads, Bardulf had devoted and exerted his total concentration towards his objective to train Gryth. The task did not prove to be difficult. It was almost as if the little dragon creature was accustomed to taking such commands. Bardulf recalled that Gryth used to be a Faery king’s mount and accepted that would be the most likely way to account for it. This entry was posted in Jasmine & Role Playing Games, The Creative Process and tagged Bardulf, crystal ball, crystal power, Gryth, The Tome of Wisdom on April 30, 2018 by Darlene.